Home / Profiles / Car Profiles / Rules? We Don’t Need No Stinkin’ Rules! 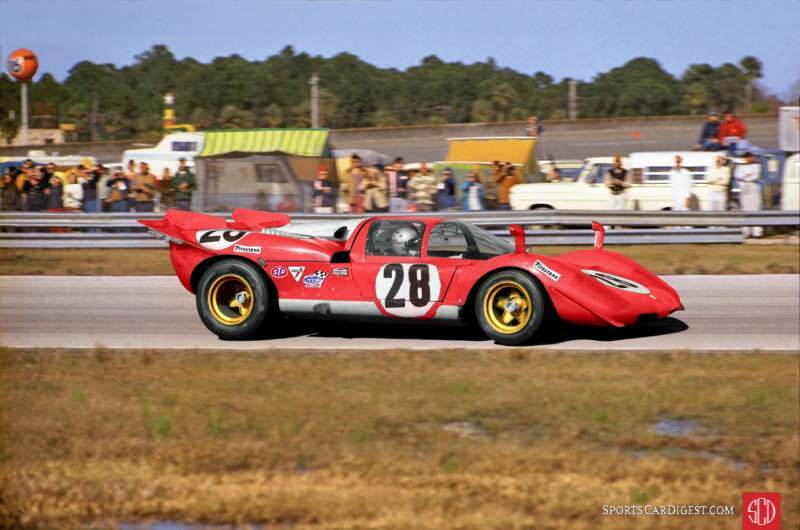 The late 1960’s and early 1970’s was a great time for motorsports especially for fans of Can-Am racing and international endurance racing like the Daytona 24 Hours and Sebring 12 Hours. It is no wonder that many refer to this period in racing as the Golden Age of Motorsports. In both Can-Am and endurance racing there seemed to be a real spirit of innovation among race constructors as they strove to produce the fastest cars on the track. Contributing to this spirit of innovation was, in some race series, a set of minimal rules that fostered an “anything goes” attitude that produced some of the most exciting and iconic race cars in the history of motorsports. 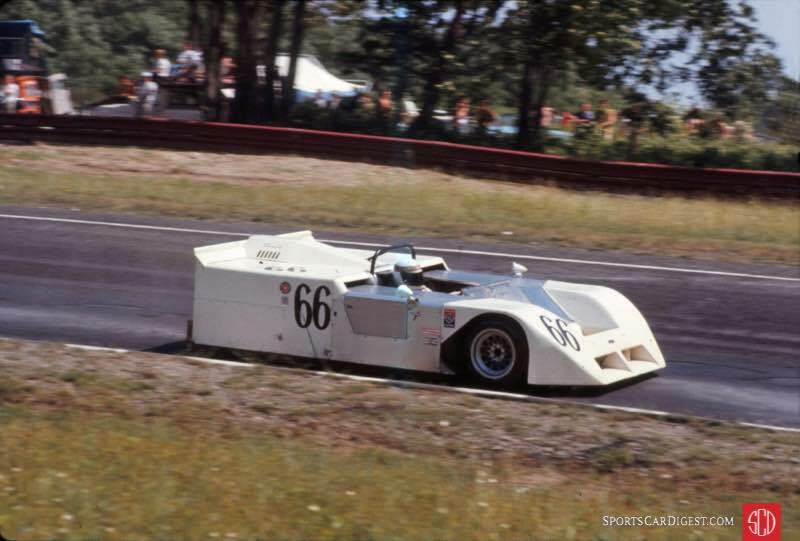 Nowhere was that excitement and innovation more evident than in Sports Car Club of America’s Canadian American (Can-Am) Challenge Cup series where cars like the Chaparral 2J wowed racing fans from coast to coast. Popularly known as the “Sucker” or “Vacuum Cleaner” the 2J used 2 fan-like auxiliary engines and Lexan skirting to create a suction that glued the car to the track. 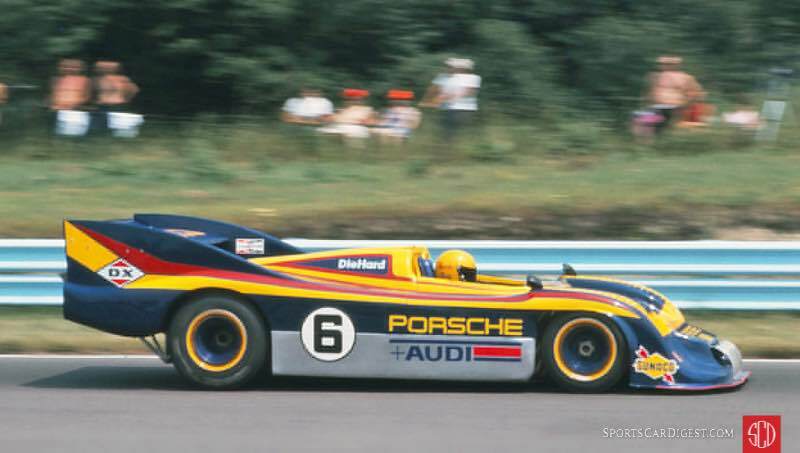 Added to that wild looking Can-Am car was the Penske Porsche 917/30 “Turbo Panzer” that sported a turbocharged engine producing up to 1500 horsepower. It so dominated Can-Am racing in 1973 that race officials were forced to come up with rules specifically designed to slow down that particular Porsche. Jackie Stewart in the Chaparral 2J “Sucker” at the 1970 Watkins Glen Can-Am 200. Bill Kutz photo. Mark Donohue in the Penske prepared Sunoco Porsche 917-30 TC at the 1973 Watkins Glen Can-Am. Bill Kutz photo. While endurance racing operated with more rules than the Can-Am series there seemed to be room (loop holes) in the rules for some creativity and as a result the iconic Porsche 917K (Kurzheck, or short-tail) came into being in 1969 and in 1970 (as a Group 5 Sports Car) they made their international debut at the 24 Hours of Daytona. At Daytona in 1970 the J.W. Automotive team, representing factory Porsche, arrived with four 917s with two designated to run the race, a third designed for practice on the Daytona circuit and a little known fourth 917 designed as a test bed for new aerodynamic body modifications and wheel configurations. 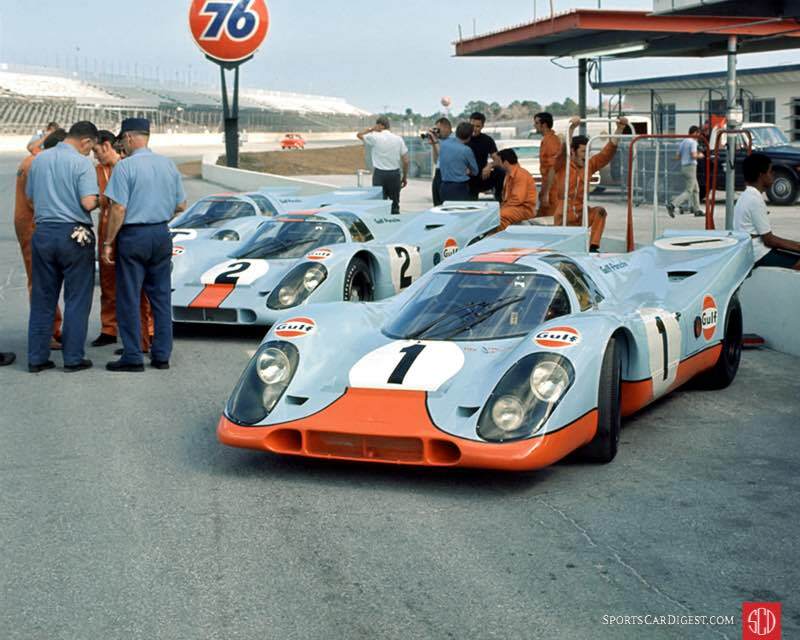 Three of the four Gulf Porsche 917s on the grid at the 1970 Daytona 24. Fred Lewis photo. This rarely seen fourth 917 was a total surprise to many including the German motorsports press and the garage that housed it was off limits to the public and press alike. Only the drivers and mechanics had access to that garage. Due to this secrecy about the car and the fact that it had minimal track time, due to an accident, that photos of the car are rare indeed. 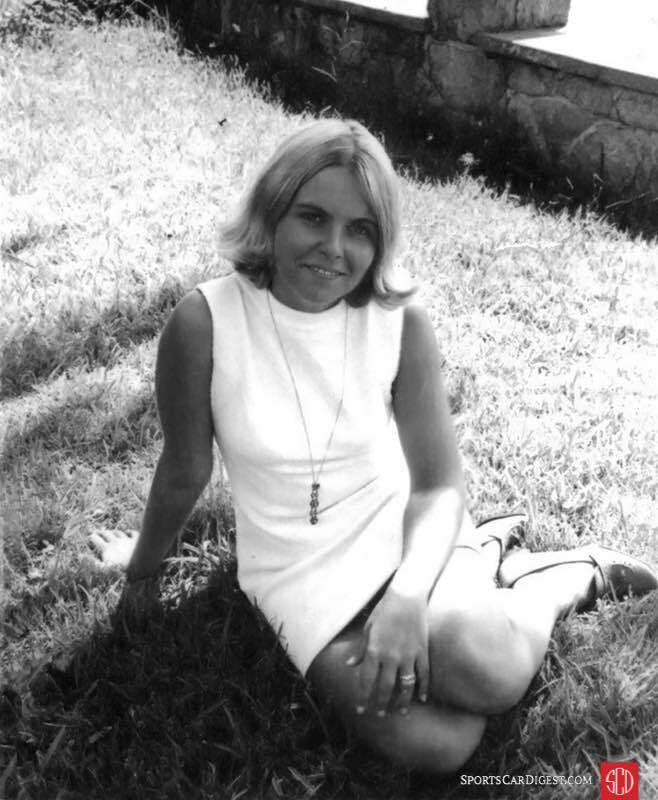 The future Mrs. Galanos used her feminine charms to go where I couldn’t go. Lou Galanos photo. I would have been clueless about that fourth 917 Porsche if not for my beautiful fiancée who, along with me, was a licensed course marshal assigned to work practice and qualifying for the Daytona 24. While I was in the worker HQ office in the paddock getting our assignments, she had wandered over to the pits and garages talking to drivers and crew alike. Being a cute 19-year-old with blonde hair and wearing a mini-dress she had no problems making friends and felt particularly welcome by the drivers in the J.W. Gulf Porsche pits. One of the drivers, no less than Jo Siffert, took a special interest in her when he found out she was also a course marshal. He invited her to follow him to the garages where three of the four team cars were housed. After entering the garages through a guarded and posted door Siffert pointed out to her the #1 Gulf 917 he would drive in the race. When asked who would drive the other two cars, both with a large letter “T” on them Siffert said he would. This greatly surprised her but Siffert explained that one of the “T” cars was just for practice but could be entered in the race if either of the two main 917s came down with problems. The front of the other “T” car had a tarp placed over the nose up to the windscreen and she asked about it. Siffert said this car was special because it was being used as a test bed for possible improvements to the 917K. Siffert pointed to an airfoil already being installed at the center rear of the car which he said would become standard on all the 917s. Siffert then lifted one side of the tarp covering the nose of the car and she gasped in surprise when she saw that there were four small front tires and no opening to facilitate the changing of tires. She knew that the nose on the other 917s were bonded to the frame and asked how they changed the tires. Siffert pointed to the latches on each side and said the entire nose lifted off if tires needed to be changed or a nose needed to be replaced. This innovation was being considered for the other 917s as well. Siffert said that race cars with six wheels could be the wave of the future in racing and he would be taking out the car that day to test the handling. He wanted to know what turn she was working and he promised to wave to her when he came through. He also took a moment to write the name of his hotel and room number on a piece of paper and with a wink asked her to call him. All she could do was smile and laugh a little. At that moment Siffert was told by a mechanic that the first “T” car was ready for him and they were taking it out to the grid. He grabbed his helmet and followed the crew out of the garage. After thanking Siffert for his kindness she quickly located me in the garage area told me what she had seen and the cute driver by the name of Jo Siffert who was so kind to her. She also told me about the six-wheel car and we should get over to turn three to be there when the car arrived. On our walk over to the turn we stopped at our car to get her course marshal coveralls and while she was changing she also told me about Siffert’s pass at her. When I asked her if she told Siffert that she was engaged she said no. We had just arrived at the turn when we saw Siffert in the first “T” car come through the turn and headed for the dog-leg followed by the #28 factory Ferrari 512S of Mario Andretti. This went on for several laps until Siffert pitted right before the end of the practice session. We then hustled over to the paddock area to grab a quick bite of lunch and then returned for the afternoon practice session. 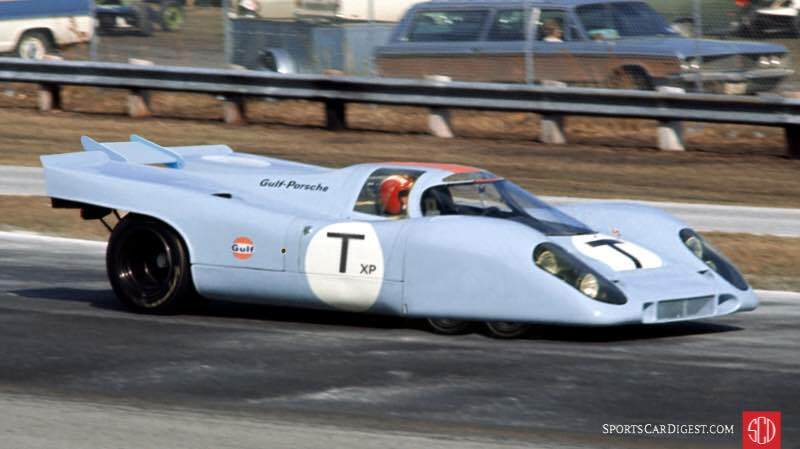 One of the two Porsche 917 “T” or training cars at Daytona in 1970. Fred Lewis photo. 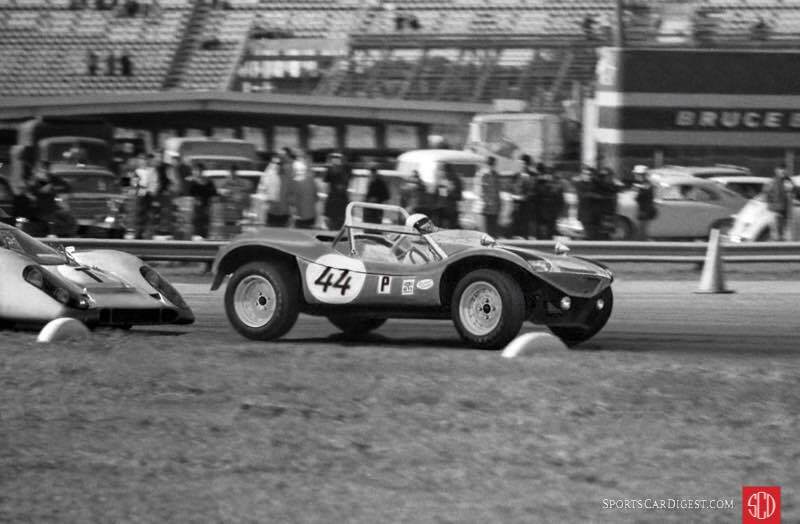 Mario Andretti in his factory Ferrari 512S that finished third behind the two Gulf 917s at Daytona in 1970. Lou Galanos photo. The afternoon session was more of the same but Siffert and the practice car were nowhere to be seen. It did get a little interesting when we saw a, believe it or not, a dune buggy going through our turn. It was officially listed as a Deserter GS Volkswagen but looked exactly like a dune buggy and not a race car you might find at the Daytona 24. It was also listed in the prototype class. About 15 minutes later we saw the second Gulf Porsche “T” car coming out of pit road and down to turn three. It was driven by Jo Siffert and he made a slow run through our turn and accelerated out of it going through 4,5, and 6 and onto the high banks. Before he exited our turn, my fiancée got close to the racing surface and struck a provocative pose and, as promised, Siffert waved. The six-wheel Porsche 917K being driven by Jo Siffert at Daytona in 1970. Composite Fred Lewis photo by Louis Galanos. On his second lap Siffert came around turns 1 and 2 very fast with the six-wheel car and down to turn 3 almost hitting the much slower dune buggy now entering the turn. Siffert attempted to pass the dune buggy coming out of 3 but the buggy refused to give way. As the two cars entered turns 4 and 5 they made contact causing body damage to both. Jon Krogsund at the wheel of the Deserter dune buggy that had a fender bender with Siffert’s 917 Porsche. Composite photo by Louis Galanos. The buggy was able to limp back to the pits, but the six-wheel Porsche stopped on the grass just beyond turn 6 with a damaged wheel and tire. Later we learned that it also suffered suspension damage and, as a result, never came out again. 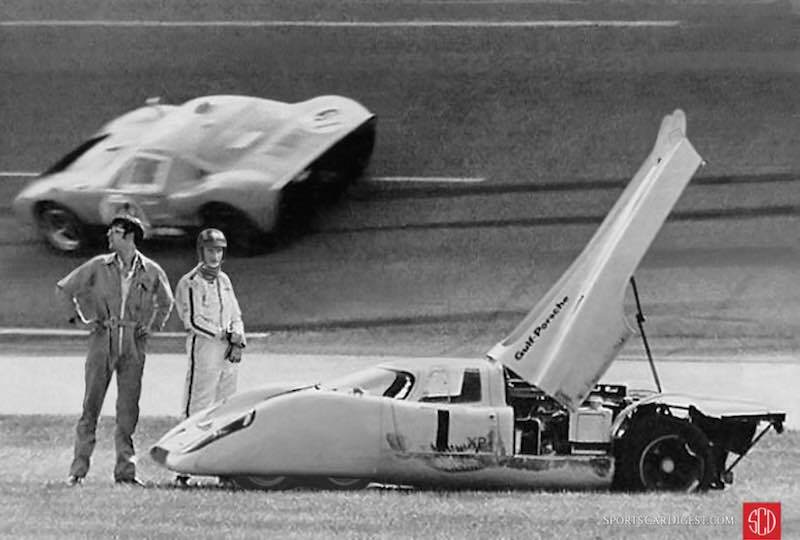 The six-wheel Gulf 917 of Jo Siffert sits disabled after making contact with the dune buggy. Composite photo by Louis Galanos. Later the stewards came out to interview us about the accident since the Gulf Porsche team had filed a protest against the dune buggy driver Jon Krogsund. The protest was denied, and the incident was listed as a racing accident which allowed the owner of the dune buggy to continue to practice and, if the car qualified, to start the race. However, the next day the car was withdrawn from the race by owner Hugh Heishman with no explanation being offered at that time. It was speculated that Heishman, who owned a VW – Porsche dealership in Virginia, didn’t want to give his business partner (Porsche) any more grief than they already had. The J.W. Gulf team was very successful at Daytona in 1970 coming in first and second overall. Three weeks later, as we prepared for the trip to Sebring for the 12-hour race, all I could think of was will the six-wheel car be entered. 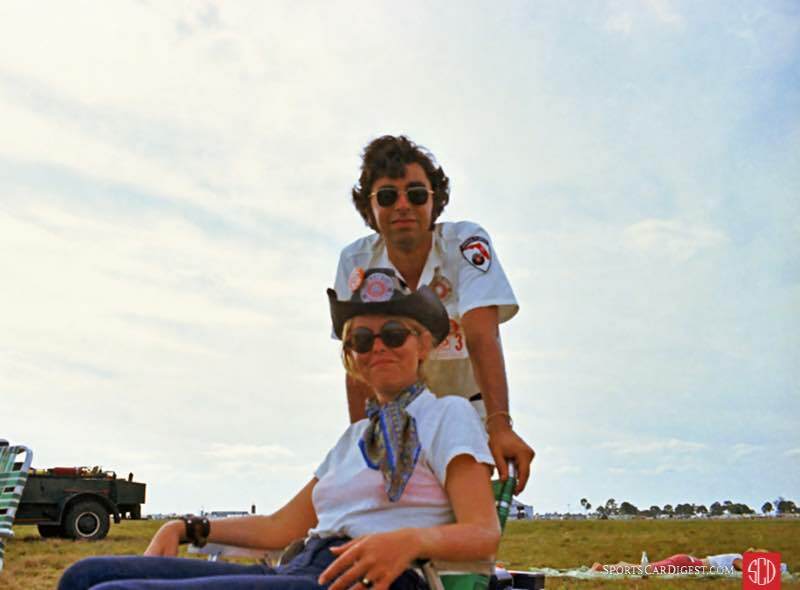 Author and fiancee at Sebring in 1970. Lou Galanos photo. 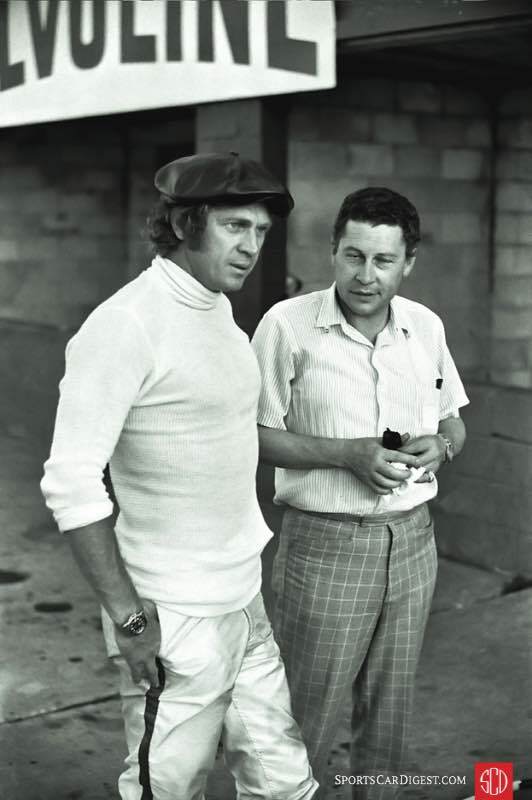 Steve McQueen and a journalist in the pits at Sebring in 1970. Lou Galanos photo. 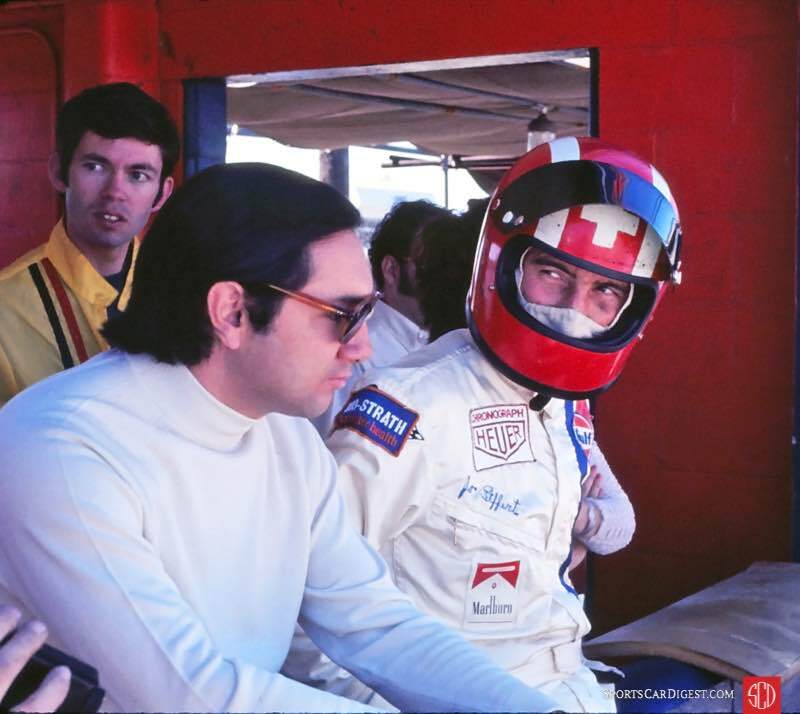 While walking through the pits we saw Pedro Rodriguez and Jo Siffert getting ready for practice. Gulf had stationed a couple of guards to keep race fans away but Siffert spotted my fiancée and called her over. She asked Siffert about the six-wheel car he showed her at Daytona and he commented to her that, for the moment, that project was on hold until they worked out some bugs in the steering. He didn’t think it would ever become a reality. 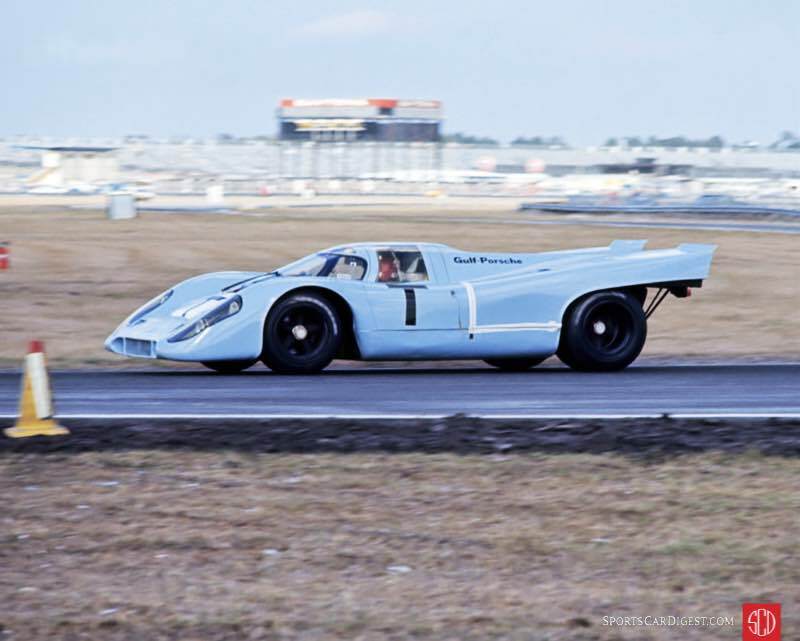 Pedro Rodriguez and Jo Siffert drove Gulf 917s at Sebring in 1970 and 1971 with little success. Bussian/Galanos photo. We worked what many call the best Sebring ever run with Mario Andretti finally winning in a come from behind Cinderella finish beating the Porsche of Steve McQueen and Peter Revson by 23.8 seconds. It was a race to remember. A couple of weeks later, on April 1 no less, we were back at the Sebring track for some testing by the Alfa Romeo factory. Besides some V8 powered T33/3’s that were still in Florida following the 12-hour race the factory had flown in, via Alitalia Airlines, a 12-cylinder, six-wheel Alfa-Romeo designated the T33/6/12. The car plus supporting vehicles, staff and mechanics landed at Sebring in a B747F Jumbo Jet. This was amazing when you consider that the longest runway at the Sebring airport was less than 5,000 feet. The Alfa T33/6/12 was a six-wheel monster with four drive wheels in the rear and two steering wheels in the front which was just the opposite of what that one Porsche 917 “T” car had a Daytona in January. Testing of that car seemed to go well but we heard rumors about handling issues that seemed hard to correct. 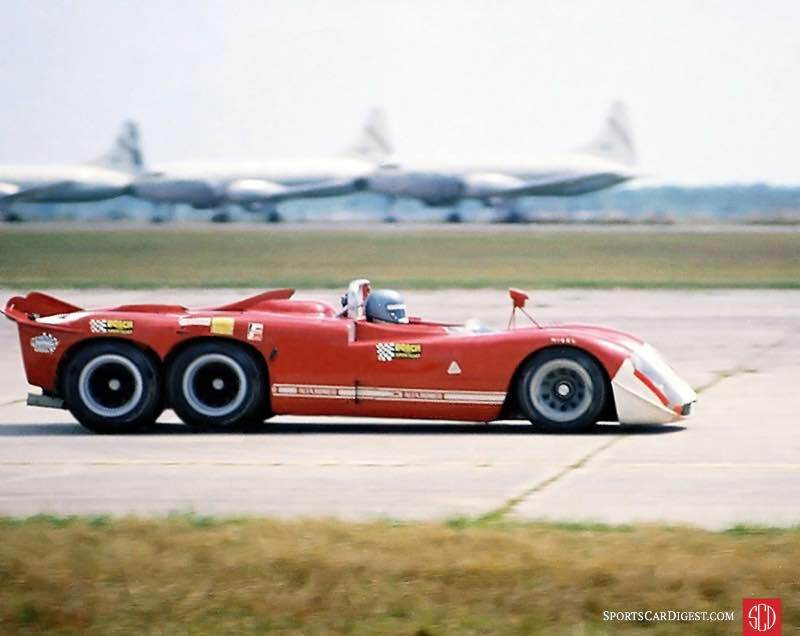 The Alfa Romeo T33 six-wheel project at Sebring in 1970. Composite photo by Lou Galanos. While six-wheel race cars have been around since the 1930’s the only era they seemed to gain traction was in the mid-70s with the development of the Tyrrell Project 34 prototype Formula one race car. Rules changes by the FIA in the early ’70s made it impossible for Porsche and Alfa Romeo to continue with development of six-wheel race cars and both projects were soon shelved never to see the light of day again. If it wasn’t for the rare photos in this story they might have been lost to motorsports history forever. Lou: Another interesting look at the golden age of racing. What an exciting era. Looking forward to more stories. Jim B. Next April include the gas turbine powered Maserati and the Jaguar with the air cushion and no wheels. Great job Lou – Always fantastic stories with unbelievable photos ! . Late braking specialist Seppi Siffert would have put all that rubber in the front to good use, for sure. Great story Lou, as always! I never would have believed it, but the photos are “proof”! Thanks for the enlightenment. A “putz like you” can give us great stories with the photos! – Thanks! Photoshop sure makes an April 1, story look more realistic! After seeing the first photo of the 6 wheel 917 my very first thought was to check the date of the article. Hmmm, April 1st. Anyone ever see the Jaguar XKEE with the straight 12 cylinder engine? I’ll never be fooled again. Thank you Lou for your great pictures and knowledge of The Golden Age of Motorsports. It keeps this era alive with all these memories. Wonderful, also Thank You for your Service ! I always look for your stories on SCD Lou, they are entertaining and interesting, with great pictures of the Golden Era, plus your wife is cute!